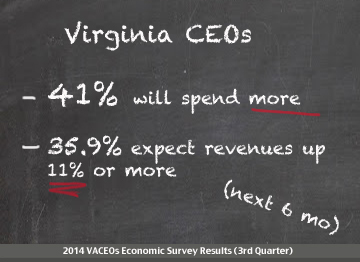 Robins School of Business – Virginia Council of CEOs survey shows highest level of optimism in four years. The survey results provided by Richard Coughlan, Senior Associate Dean at the Robins School of Business, provide a snap shot of the overall economic outlook index for various companies within the region and help central Virginia companies anticipate business decisions and plan for growth. The third quarter 2014 CEO Economic Outlook survey by the University of Richmond’s Robins School of Business and the Virginia Council of CEOs finds strong optimism among chief executives in central Virginia. The survey’s Economic Outlook Index, launched in mid-2010, reached an all-time high this quarter.